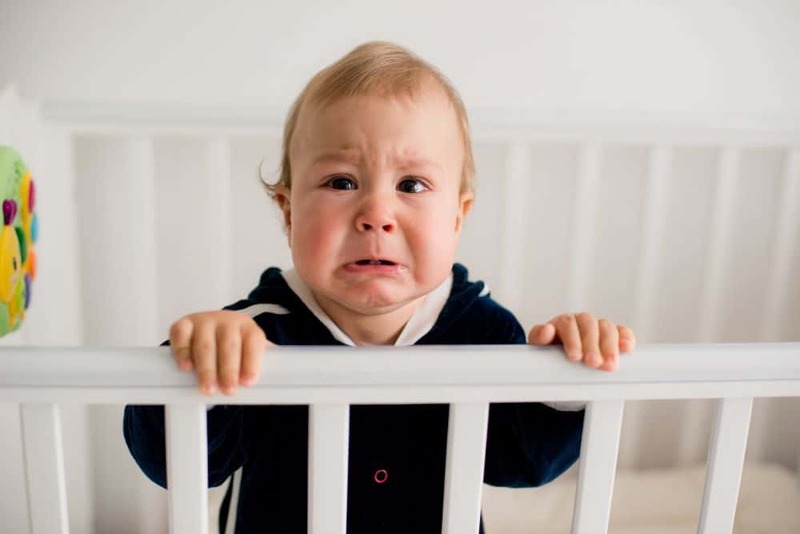 The Cry It Out Method: Worse for Baby or You? Are you still rocking your six-month-old baby to sleep every night? Maybe they are still waking through the night, demanding your attention. Are you wondering whether it’s time to try sleep training, like the cry it out method? It can be tough as your baby gets older, trudging to the nursery all evening and through the night to settle a crying baby. I thought I was one of the lucky ones — my first baby slept through the night from about four months old. Along came the second one, and boy, was it different. I think my husband and I wore out the floorboards, going back and forth to the nursery all night for months. After eight months of this, we decided it was time to try sleep training. Here is what we found out about the cry it out method. Sleep training encompasses various methods which can be employed to try to get an older baby to sleep through the night. It also helps them learn to soothe themselves to sleep without the need for intervention from you. Sound like a good idea? Be warned, the chances are it will be harder for you than your child. There will undoubtedly be lots of tears, from both your baby and you. Tough love is never easy to implement. Sitting outside the nursery listening to a distressed little one is never going to be a walk in the park. For some, though, perseverance can pay off if you’re prepared for some sleepless nights. The cry it out method works by letting your little one cry for set periods of time before you offer some reassurance and comfort. The intervals for which you let baby cry increase gradually. The idea is they teach your baby to soothe themselves to sleep. If this sounds like something you could be comfortable with, then there are a couple of things you need to know. It doesn’t mean you leave your baby to cry and fret all night without any attention or comfort from you or your partner. Also, the chances are you will suffer more than your baby throughout the process. One of the popular methods for cry it out is the Ferber method. This tells you to wait until your baby is ready to sleep through the night, both emotionally and physically. This will generally be at about six months but for some babies, it may be sooner (source). Every child is different and if you’re unsure whether your baby is ready, speak to your healthcare provider. When your baby is sleepy but still awake, settle them in their crib. Give your child a kiss, say goodnight, and leave the room. If the crying starts when you have left, then wait for a set amount of time. We will detail Ferber’s suggested times in a moment, but you can set the time yourself. If the crying continues for the set time, go back into your baby’s room for a minute or two, no longer. Gently reassure them in a soothing, quiet voice but do not pick them up. Leave the room again while your baby is still awake, even if they’re still crying. Stay out of the room, this time for a little longer. Follow the same routine of comforting and leaving, each time extending the periods outside the room until you reach a set maximum. Continue with this until baby falls asleep when you aren’t in the room. Should your baby wake again, then follow the same steps, starting with the minimum interval again and increasing them as you did before. Each night, increase the amount of time you set between visits into the nursery. You should find this will mean your baby will be soothing themselves to sleep after the third or fourth night. Carry on for up to a week, but if your baby is really not getting it, then wait a week or so and try again. Night one: Three minutes for the first interval, five minutes for the second one, and 10 minutes as a maximum for the third interval. Each following interval that night should be at the 10-minute maximum. Night two: Five minutes for the first interval, 10 minutes for the second, and then 12 minutes as a maximum for the rest. Each subsequent night should then have longer intervals between your nursery visits. These times are not set in stone and you can choose how long you wait before comforting your child. If you’re comfortable starting with a lesser or greater amount of time, it’s your choice. The method can also be adjusted to work for older children who won’t stay in their rooms and sleep. Setting a bedtime routine will let your baby know that it’s coming up for sleep time. You might decide to bathe the baby, feed them, read them a book, sing them a lullaby, and then put them to bed. Do this at the same time every night and don’t veer from it. Baby will learn to expect what is going to happen. This can make the process easier for them. A consistent daytime schedule with naps included can also help establish a routine which baby will recognize. Agree on a plan between you and your partner as to when you want to start sleep training. Set the times for your intervals out of the nursery and stick to them. Make sure you both fully understand how it works and what roles you’re going to play. You could alternate visits to the nursery, or maybe mom does the first ones and dad the latter ones. It doesn’t matter how you do it as long as you’re both on the same page. This will also help you to support each other better when the going gets tough. Make sure your schedules are compatible with starting this process. It’s not going to help if nanny and grandad are staying, or your partner is working late or is out of town. It’s also a good idea to make sure you’re both ready, physically and emotionally. If other worries are playing on your mind, wait until you’re ready as well. Once you begin the cry it out method, you need to stick to it. Tempting though it might be sometimes to pick your baby up and soothe them, you need to be consistent. Give in and you will need to start all over again. You and your partner might decide the time is just not right for your little one. If they appear not to be ready, then put it on hold. It’s likely your sleep will be interrupted when you begin this method of sleep training. Try to start on a night when you won’t be affected as much by sleep deprivation the next day. These nights could be difficult for you. You might well end up in tears, hearing your baby crying. It’s a good idea to set a timer for your periods out of the nursery and move somewhere else in the house. You could try listening to some music or doing something you and your partner enjoy. Maybe you have a hobby, like quilting or crafting, you can concentrate on until it’s time for the next soothing session. If it all gets too much, make sure to tag team. You or your partner could go for a walk while the other one takes over. Maybe take a nice hot shower or bath, and come back refreshed and ready to start again. We mentioned how long the intervals you create aren’t set in stone, well, neither is the process. You can adapt it to suit you if you think it will be harsh for your baby. You might find that increasing your intervals every other night works better for you. It might mean the program will be extended over two weeks rather than one. Everything could be running smoothly once you have finished this method of sleep training. Baby goes down with no problem, falls asleep, and stays asleep. You might be thinking you’ve finally cracked it. Be warned, if a little one is not well, or there is a change in routine like holidays or visitors staying, relapses are possible. Once things are back to normal, then the sleep patterns should resume. If not, you know what to do to get them back on track. 7. Will This Work for My Baby? You might be among many of the moms and dads who find this process works exactly as planned. Three or four nights of perseverance and all is happy and peaceful in your home. No more crying baby in the middle of the night. That being said, it does not work for every baby. It could work for your first and maybe your second child. Along comes the third, and they just aren’t playing ball. If that’s the case, then it’s back to the drawing board to try something else. There are some who believe the cry it out theory is not good for babies. Each baby is an individual and some will be ready and have the right temperament for it, while others won’t. It’s your decision as to what will be best. Cry it out sleep methods have been tried and tested, and definitely work for many. They might be distressing and difficult for both you and your baby at the time. The good news is they don’t have any lasting effect on babies (source). It isn’t a method that appeals to everyone, and it won’t work for all babies. If you’re against this method, or it doesn’t work for you, you can still employ some of its elements. Not running into the nursery at every little sound, but waiting a short while instead, might encourage your little one to soothe themselves to sleep. We hope you found some useful tips and insights from our guide. Have you tried this method? Has it worked? We would love to hear your experiences. Please leave us a comment and don’t forget to share with other moms and dads.